Stitched2save9 is an eco conscious brand that makes cloth bags of all kinds using mostly upcycled fabric. We are rooting for the yoga mat bags. Stitched2save9 was started by city-based Josephine Joseph with the intention of reducing the dependency on plastic bags. The upcycled bags are made out of used curtains, bedsheets, and denim that you don’t have the use for anymore. 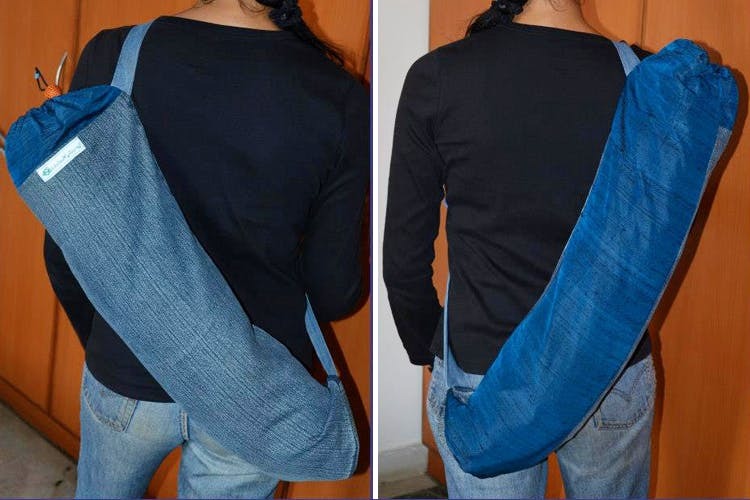 She makes reasonably priced, yoga mat bags made from cotton, denim, polyester, nylon to canvas or upcycled fabric, usually with a drawstring option or a full length zipper. She also customises the bags according to the mats you are using — like the manduka or the yoga rugs need a bigger circumference and sturdier yoga mat bags to handle the extra weight of the mats. The yoga mat bags are durable and very comfortable — your hands are free and you can keep it anywhere without worrying about the mat opening out. There is also a feel good factor to it since it is made out of upcycled fabric. It is also easy to maintain since it is made of fabric. Simply wash and dry.